The Chinese-produced C919 passenger jet, produced by the Commercial Aircraft Corporation of China (COMAC), has made least seven test flights at the Aviation Industry Test Center in Yanliang, Shaanxi Province, since November 23, officially embarking on its airworthiness certification phase. Yuan Wenfeng, Director of the C919 Project Office, said COMAC is speeding up to the pace of gaining an airworthiness certification for C919. The goal is to get its certification by 2020. COMAC hopes to deliver the first batch of C919 to customers in 2021. On November 30, a second C919 aircraft carried out a glide test at Shanghai Pudong International Airport. The second jet is expected to make its maiden flight later December. The C919 aircraft project has attracted world attention. The director noted that the development of the C919 is meant to reduce China's dependency on Boeing and Airbus, as well as stimulating the development of China's aviation industry. "Firstly, the C919 airliner helps the development of many basic disciplines. Lots of science and technology knowledge goes into its R&D process. We have cooperated with 36 domestic universities in the research and development of the C919. Furthermore, as a passenger plane, it must have the same airworthiness standards of other passenger jets in the world. To realize this, we have to use a lot of technologies for the C919, which will promote China's overall aviation technology progress. Meanwhile, the C919 project plays a leading role of the country's civil aviation industry," said Yuan Wenfeng. As one of the main achievements of China's scientific and technological innovation in the past five years, the C919 passenger aircraft was mentioned in President Xi Jinping's report to the 19th CPC National Congress. Yuan suggested the aircraft manufacturer is adjusting its development goals, with a target to become a respected and recognized international enterprise like Boeing and Airbus. He added that the nine-year-old Shanghai-based company is committed to the continuous development of civil aircraft, bringing better and safer travel experiences for passengers at home and abroad. 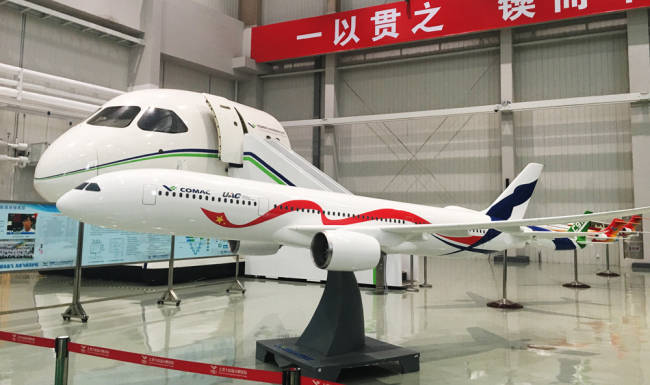 Yuan Wenfeng, Director of the C919 Project Office, said COMAC is speeding up to the pace of gaining an airworthiness certification for C919. The goal is to get its certification by 2020.